Elie Wiesel Archives - Joelle Delbourgo Associates, Inc. In fact, he taught at Boston University for nearly four decades, and with this book, Ariel Burger—devoted protégé, apprentice, and friend—takes us into the sacred space of Wiesel’s classroom. There, Wiesel challenged his students to explore moral complexity and to resist the dangerous lure of absolutes. In bringing together never-before-recounted moments between Wiesel and his students, Witness (Houghton Mifflin Harcourt, November 2018) serves as a moral education in and of itself—a primer on educating against indifference, on the urgency of memory and individual responsibility, and on the role of literature, music, and art in making the world a more compassionate place. 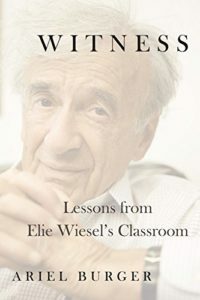 WITNESS: Lessons from Elie Wiesel’s Classroom (Houghton Mifflin Harcourt, November 2018) is his first book. When I was 17, I embarked on a spiritual quest that brought me to many teachers. Of all my teachers, Elie Wiesel was the greatest. To tell you who I am is impossible without including the influence this man has had on me. I grew up in New York City, an artsy kid in an ultra-Orthodox elementary school, with a blind sister and divorced parents who held very different views on life. My quest for meaning and integration, a way to bring together all the elements of my life into a whole, led me to study for seven years in the closest thing to a monastery Judaism offers. 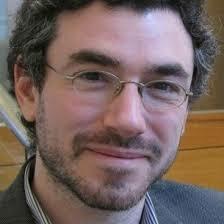 I became a rabbi, wrote hundreds of songs and played guitar at Carnegie Hall with Richie Havens, exhibited art in galleries, danced with thousands of Breslover Hasidim at their annual pilgrimage in Ukraine, participated in dialogue groups between Jews, Muslim, and Christians, got married and had four children, got a PhD in religion and conflict transformation, illustrated folktales, became a teacher, worked as an executive at a non-profit for six years, taught, lectured, led workshops on leadership and Design Thinking, and began using storytelling to connect people across communities. 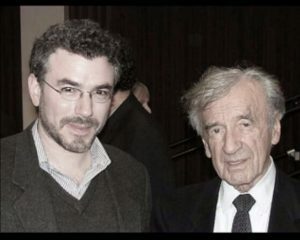 I questioned everything in search of an answer, but it wasn’t until I met Professor Wiesel that I realized that questioning is the answer. He helped guide me to where I am today – a teacher, artist, speaker, spiritual healer, and now the author of a memoir of the time we spent together. At a moment when the loss of civility is eroding human connection, I draw on my teachers’ lives and wisdom to help promote civility and kindness. My mission is to help counter superficiality with nuance, to replace estrangement with encounter, and to empower people to be creative and kind citizens of the world. I do this through teaching, storytelling, art- and music-making, writing, coaching, and consulting.